Don't you love serendipity? More than once, it's played an important role in my life-- most recently in the days leading to the month-long trip Denis and I took to the UK. Some of you know that on Fridays I post a batch of (usually) book-related links that I've found on the internet. 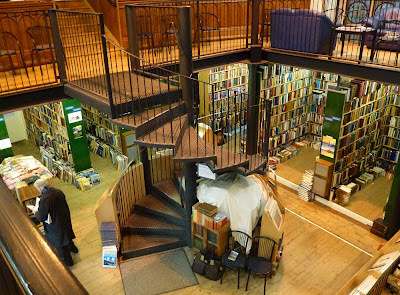 A couple of weeks before we were due to leave for England, I happened across someone's post of (however many) "most beautiful bookstores in the world." I began scrolling through and after recognizing the first six or seven as ones I'd seen many times before, I almost closed the browser window and moved on. For some reason, I scrolled on... and I came upon a photo of a bookstore that made my jaw drop and my tongue hang out of my mouth. 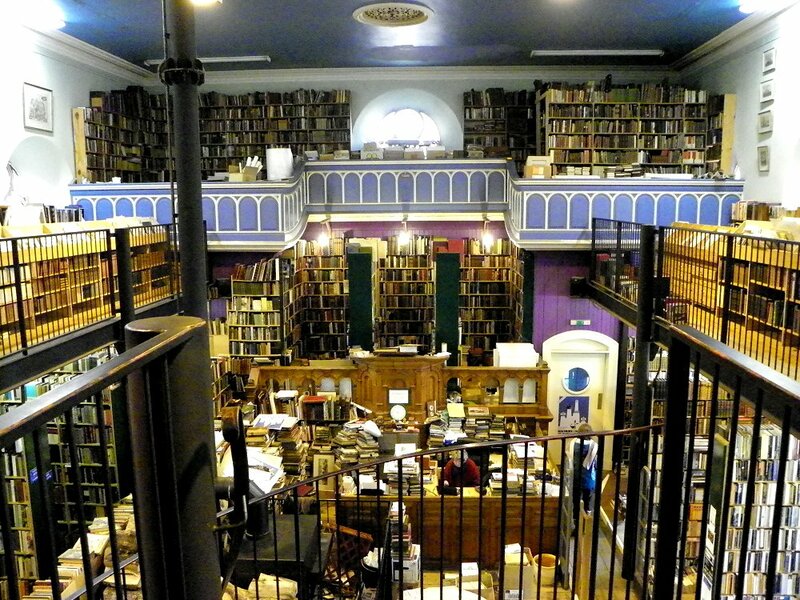 The caption read "Leakey's Bookshop, Scotland." 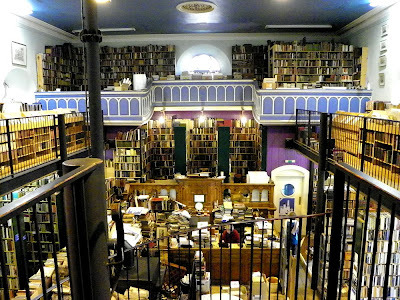 I Googled it, although I was certain I'd find that the bookshop was in Edinburgh, and we were not going to Edinburgh this trip. When I clicked on a link and "Inverness, Scotland" was staring me right in the face, I think I shrieked with surprise and sheer glee. Denis and I were going to be staying in a cottage on the shore of the Cromarty Firth... just a few miles out of Inverness! I told Denis about my find when he came home from work. He found it easily on Google Earth and found out that Leakey's has a Facebook page. He sent them a message about parking and received a quick reply. Leakey's was officially on our itinerary! The entire month we were in the UK, it was bitterly cold, and the sun seldom shone. In fact, we saw more sun in the extreme northwest of Scotland than anywhere else on the entire island. But the day we drove to Inverness, the sky was almost uniformly grey with only brief flashes of brilliant sunlight. As far as I'm concerned, Inverness is the best shopping city in the UK. We parked in a multi-story car park (er... parking garage to us Americans) that was right next to the bus station. Leakey's was a two-block walk from the car park. 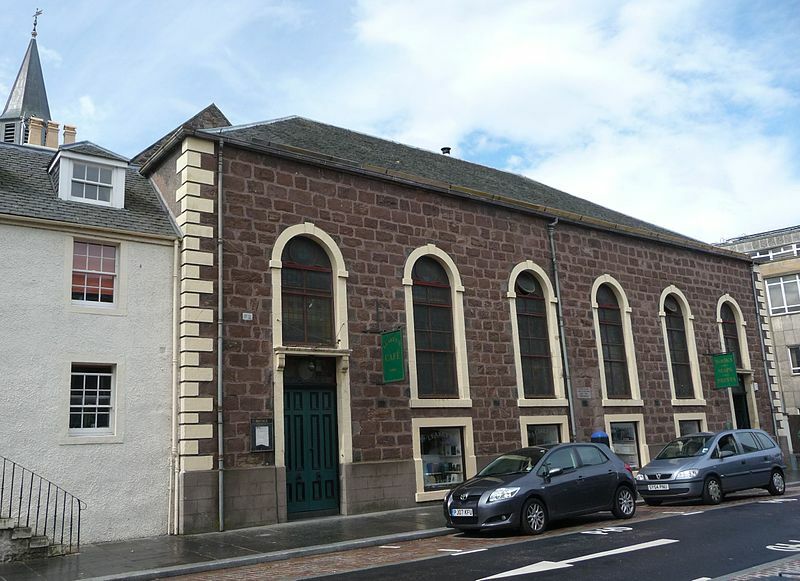 A couple of blocks in a slightly different direction will take visitors to two different shopping malls-- and this was all in "downtown"-- the old city center of Inverness, on the banks of the River Ness and within walking distance of the castle! Trust me, you just don't get this kind of convenience in the UK (and for a good reason)-- my mind still boggles! Leakey's is a block away from the pedestrian bridge across the River Ness, and there are all sorts of marvelous shops along its banks to be explored. But there was a bitter wind blowing, and I had a bookstore in my sights, so I didn't want to tarry long. After climbing a few steps, Denis and I entered a small vestibule. 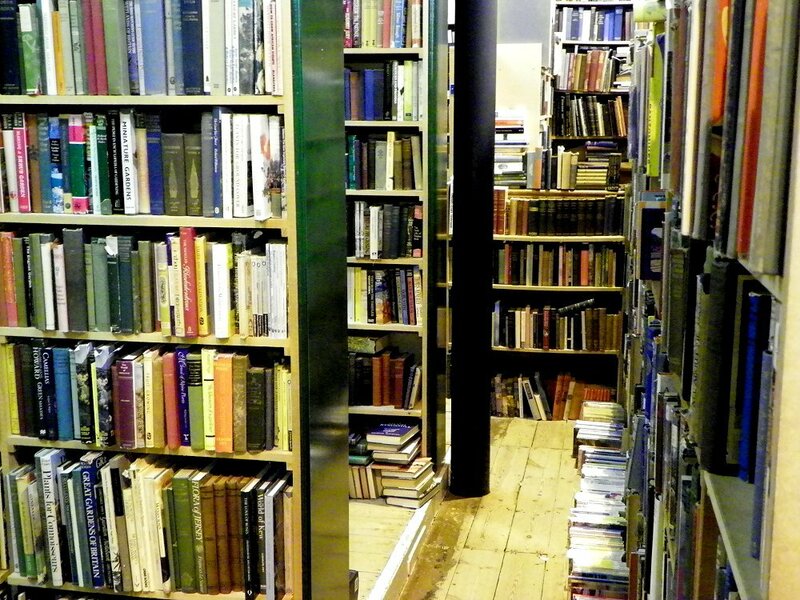 Up another step or two, open a door, and... look upon a Book Lover's Wonderland! I think Denis took one look at my face and didn't say a word; he just moved on and did his own exploring and browsing and left me to my own literary communion. Immediately to my left were modern fiction and paperbacks, but I didn't even stop. I took a few steps inside and peeked at the woman sitting at the front desk. 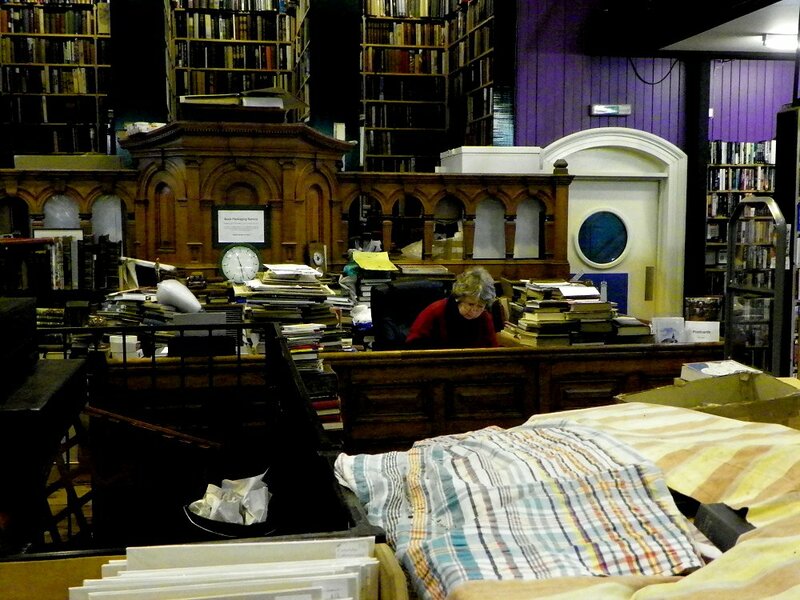 She was surrounded by stacks and piles of lovely books. Then I think my attention was drawn to the architecture of the building itself... to the row upon row of books... and to the big wood-burning stove in the center of the room, throwing out waves of blessed warmth. I then heard the clink of cutlery upon plates and the murmur of quiet conversation. I looked up and there was the café. It was lunchtime, and it was packed up in that tiny space. The daily menus on Leakey's Facebook page sounded delicious, but the best judges of the food are always the locals, and it was obvious that this was a popular spot to eat. No doubt about it, Denis and I would be sampling the cuisine before we left! Now I'm going to shut up and let my photos do the talking for me. I hope you enjoy your tour of Leakey's because it's definitely a place that I plan to return to as often as I can. The heat was welcome on a bitterly cold day. Spiral staircase leading to the upper floor and café. Looking over to the café. From the top of the spiral staircase. Where we waited for the café to clear out a bit. If you're wondering about those meals in the café, I had the tuna mayonnaise, and Denis had the curried tomato soup. Both were absolutely delicious! I took many more photos than this, and if you're either a Facebook friend or if you've liked the Kittling: Books Facebook page, you are more than welcome to take a look at all the others. It was a truly wonderful day-- and all because I didn't give up on an article I thought I'd read before! What a wonderful surprise! I try to find special book shops when I travel, but I've never found anything like this. How exciting!! Love at first sight, Frances! Oh, bliss! There is nothing like a good bookstore on a blah day ... what a lucky strike you had! And I agree ... working in a bookstore is a dream job! Heaven, indeed. My kind of job, my kind of place. Glad you enjoyed your "visit"! Cathy - What a wonderful place that bookshop must be! Wow! Thanks for sharing. You're very welcome, Margot. Glad you enjoyed it! How great. I wish its clone were within walking distance of my abode. 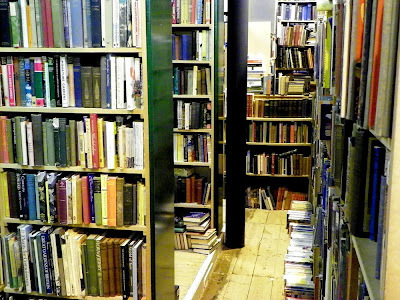 A bookstore with so many books they can't shelve them all? That really is heaven. I love this place. Unfortunately I missed it when we were in Inverness briefly several years ago. Guess what's on my must see list when I return to Scotland? I am in heaven just looking at the pictures. And it's even better when you're there in person! Scotland is on the short list of places my husband and I want to visit--he for the distilleries!! I now have a place to put on my list. Scotland is also home of my ancestors who moved from there to Va mountains in 1700's. Denis visited a couple of distilleries while we were there, Teresa-- and my ancestors also came from Scotland. Mostly the Highlands, and they arrived in Virginia and North Carolina in the early 1700s. Who knows? We might be distantly related! The bookstore does look really beautiful, and absolutely enormous. I love all the comfy looking chairs, which is really what you need in a bookshop. Wow! You could get lost in there! Wonderful. I'm hoping to be up in that area in the autumn and Leakey's will be on the itinery. I look forward to reading about your experience, Cath! What a delightful bookish day! It certainly was! And being in Inverness just made another of my favorite series written by A.D. Scott even better! Cathy, Ive just stumbled across this post. Sorry, sorry, not paying attention! Anyhow, you've reminded me that Beneath the Abbey Wall was set all around here --so the kirkyard (churchyard) in the book was the one on the walkway down to the Greig Street bridge. Steps in my day, and I am so glad you visited the town --so much bigger 3 times the size, since my childhood, but the river never changes, not the castle, but the Gaelci church now a bookshop, that I never envisaged. Deborah, you would've smiled if you'd been able to see me read Beneath the Abbey Wall--- I recognized so many locations from my visit to Inverness! As much as I enjoyed that city, I have to admit that the place I fell in love with was Durness. Right, for that I will endeavour to include Durness in a new book - the setting for book 6 is Dornoch and Golspie but as I will be in the Highlands for August I will plan a trip to Durness. PS did you get a galley of the new book The Low Road? I'd love to have your feedback. Any place in the Highlands would be wonderful as far as I'm concerned. I love to visit there. Yes, I recently downloaded a digital galley of The Low Road, and I'm just about to begin reading it. Your books are always a treat for me to read. Oh no! 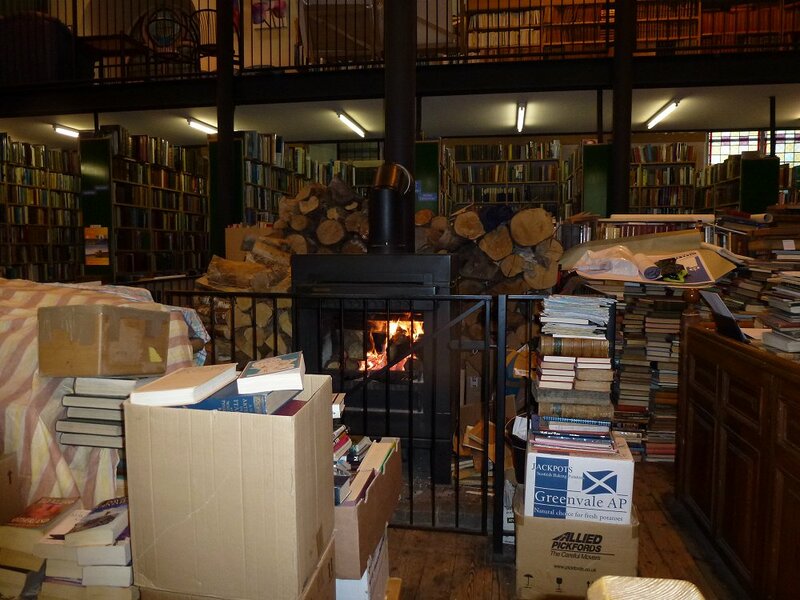 I missed going in to Leakey's the week before last when we paid a very short visit to Inverness! I can't believe did that - you see I was looking for art materials and actually walked past Leakey's on the other side of the road, meant to look in and didn't!!! 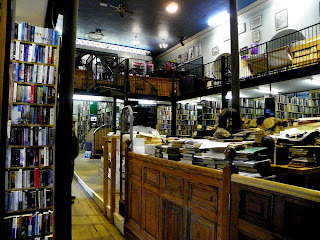 But looking on the bright side we hope to go back for another visit - and I definitely will be going into Leakey's. I agree about Inverness being a great shopping centre by the way. I was impressed. On our way back to Coylumbridge where we were staying we drove along the shore of Loch Ness, so beautiful even on a cloudy day. 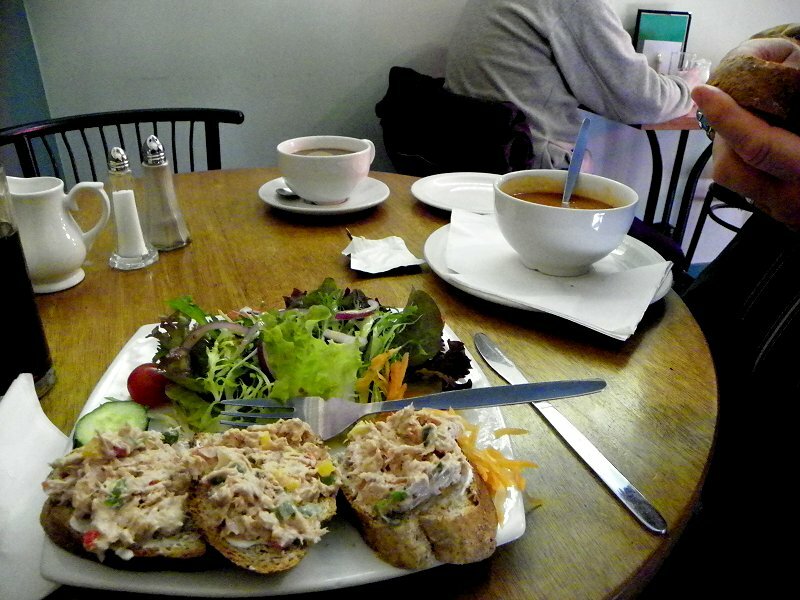 Don't forget to have lunch in the cafe when you visit Leakey's! Denis and I took a cruise down Loch Ness down to Urquhart Castle. Even on a bitterly cold and windy day, Loch Ness is beautiful. Oh oh. Next time Denis and I are up there, guess where we'll be going! 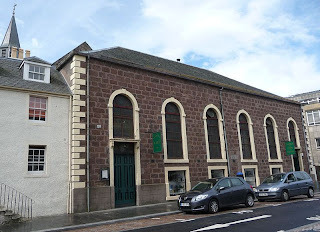 Don't get you hopes up too much for Beauly - it is quaint (like Strathpfeffer) but nowhere near the selection that Inverness has. Thanks for letting me know this, Rebian!